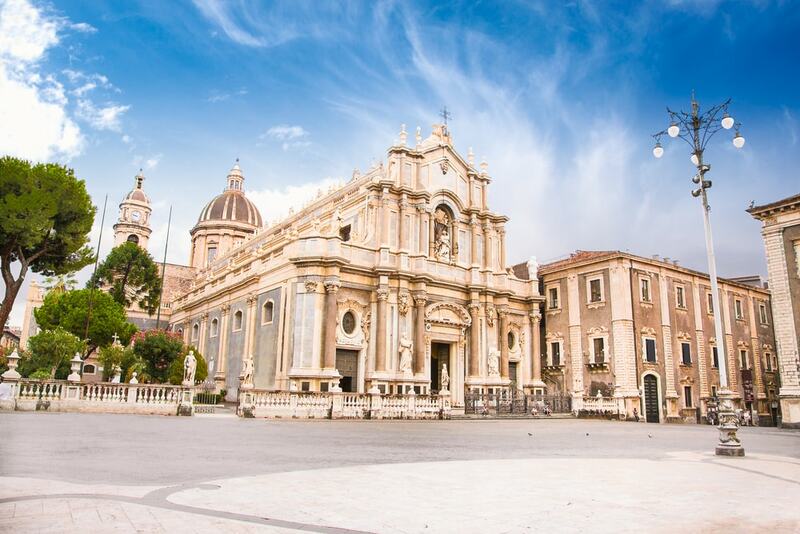 Catania is famous for one thing, the nearby and imposing Mount Etna volcano, and this 8th century city is also one of the most important cultural centres in the country. History, as always, in Italy is prominent and impressive and time spent in this will be well rewarded with good food, history and its wonderful street restaurants. Built using a contrast of lava and limestone and encircled by wonderful baroque period the Piazza is stunning and its no surprise that it is a Unesco World Heritage Site which has at its heart the impressive Cattedrale di Sant’Agata and the Fontana dell’Elefante (see below) in the centre, and nearby you’ll find another fountain, Fontana dell’Amenano, which sits at the entrance to Catania’s fish market. 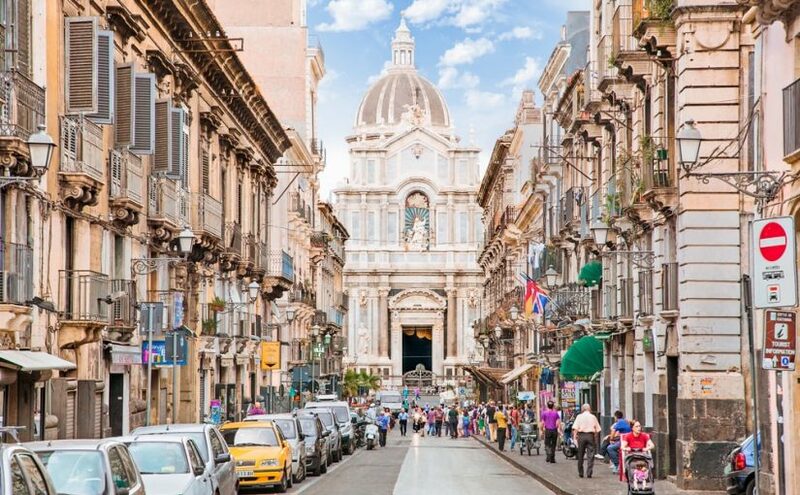 If you like the hustle and bustle of a busy local market then Catania’s infamous fish market, which fills the streets behind Piazza del Duomo every weekday morning, is a sight to be seen and experienced! Here you’ll find an abundance of stall filled to the brim with seafood of all descriptions, shapes and sizes from fresh mussels to local octopus. Locals, dressed very well as ever, mingle wit the workers and sellers and I said before, it is worth going just for the spectacle of the event, not to mention the wonderful fresh fare on offer! Nearby you can taste the seafood immediately at one of the local restaurants. Close to the Piazza del Duomo the remains of a 2nd-century Roman Theatre can be found and next to it is the Casa Liberti which is a wonderfully restored 19th-century apartment which these days houses some two thousands years of items found while the site was being excavated. When you get to the ruins you’ll see that they are surrounded by old apartments covered in vines that somehow enhance the ancient ambiance. Legend has it that the elephant belonged to an 8th-century magician, who, the legend states, mysteriously changed people into animals. The object is also rumoured to be able to calm down the volatile Mt Etna! Smiling broadly the Fontana dell’Elefante (Elephant Fountain) is made of lava stone and dates back to roman times from the Roman period. Known locally as Liotru the elephant is the symbol of the city. If shopping is on your list then Via Etnea is a must and if you head in down to its southern end, Piazza dell’Università, you’ll discover some superb eateries for the much needed break and opposite on the other side of the square is the city’s university Palazzo dell’Università. 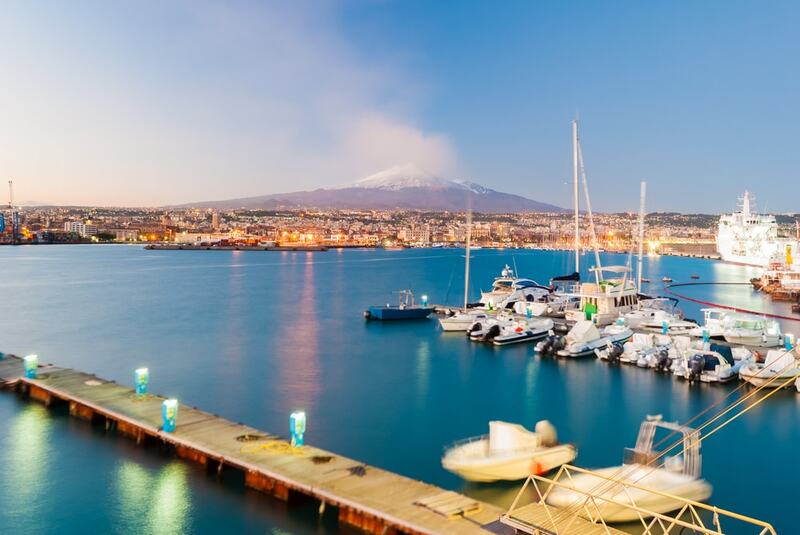 Once on the Via you’ll see the magnificent Mt Etna rising triumphantly into the clouds. The Via which is full of shops of all sizes is a busy place especially on Saturdays when locals, who are very fashionable, will be browsing and shopping. As I say if you like shoos, come here! The Complesso Monumentale Monastero delle Benedettine is a complex spread over three sites including a Benedictine convent, the Chiesa di San Benedetto and the Museo Arte Contemporanea the best if these, for me anyway, has to be the 300 year old church which holds some impressive and graphic art works and is well known for its impressive stucco and marble decoration. With over 80 offices in Europe Goldcar is the ideal choice for cheap car hire when you travel. With offers and benefits for customers Goldcar can offer the very best deals on holiday car rental in the most popular tourist destinations. Check out their website, Goldcar.es to find the best prices, offers to take advantage of. 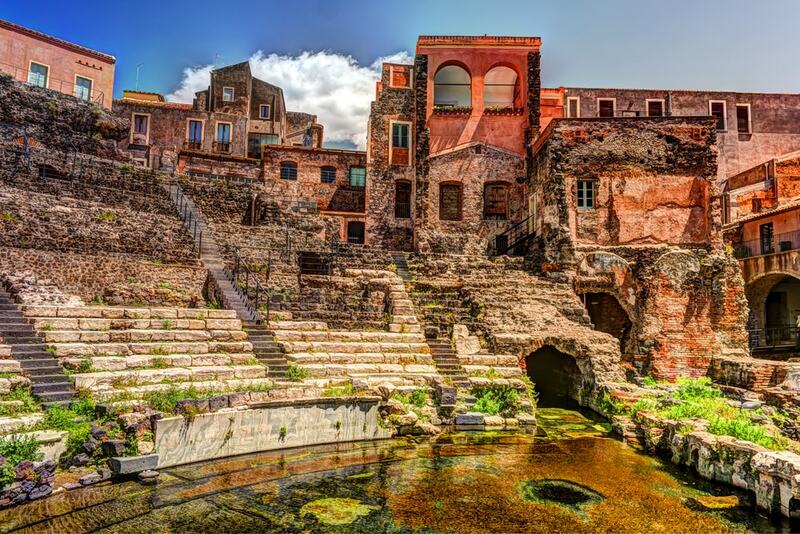 Catania is famous for one thing, the nearby and imposing Mount Etna volcano, and this 8th century city is also one of the most important cultural centres.